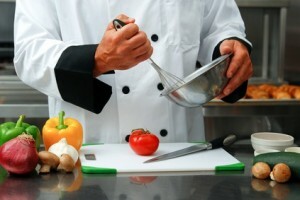 A new culinary arts facility in Santa Rosa, CA is ready to open its doors in January. Santa Rosa Junior College’s students and the members of the surrounding community will benefit from new specialty course programs and retail kitchens open to the public. The B. Robert Burdo Culinary Arts Center is a newly constructed, two-story teaching facility under planning since 2003. Students already enrolled in the cooking school are currently attending classes at two different locations; at the school’s Garcia Hall on campus and at Santa Rosa’s Brickyard Center. All of the culinary art students’ classes will be move to the new building at the beginning of next year. The Culinary Arts Center is built to exceed the state’s current energy code requirements by up to 10% with its energy efficient construction, recycled carpeting, and updated conservation systems. The school is made up of two stories, both of which house teaching kitchens, classrooms, and student lobbies for approximately 72 students. The first floor of the new building contains a public restaurant, bakery, and café where students learn real-world customer service skills with hands-on experiences in consumer focused cooking. This has been a cornerstone of the cooking school’s program at the Brickyard Center location in past years. The first floor of the new Culinary Arts Center also hosts a demonstration kitchen, chocolate and ice cream stations, a wine studies section, pizza oven and, of course – a dining room. The second story contains faculty offices and a deck. Public parking and an outdoor patio and grill are available on the outside of the facility on the ground level. The Culinary Arts Center cost the cooking school $20 million obtained through outside funding. Co-chair Michael Salinger said in a March interview that the investment will help to fulfill the objectives of preparing students to serve in the local hospitality industry, manage and operate working dining establishments, and interact with customers.